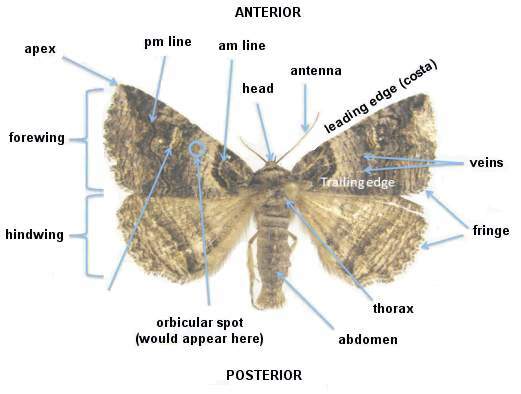 Below is a glossary of terms used on the website, and graphics showing lepidopteran and odonate anatomy. Click on each image to enlarge. Abdomen - In insects, the abdomen is the posterior section of the body (comprised of head, thorax, and abdomen) and encloses the gut and reproductive organs. Anterior - located near the forward end, closer to the head. It is used in contrast to the term posterior. Apical - located near the tip or the apex. In Lepidoptera and Odonata this usually refers to the tip of the wings. Basal - close to the base. 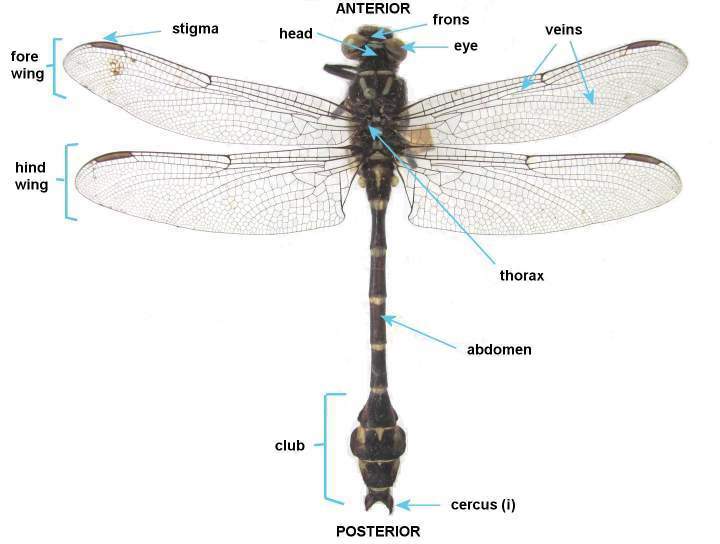 In Lepidoptera and Odonata this may refer to the area of the wings closest to the body. Bivoltine - Organisms that have two broods per year. Brood - For an individual, a brood refers to offspring hatched at one time. For a population of an species, it refers to all the offspring hatched at about the same time. See also: univoltine, bivoltine, and multivoltine. Discal cell - In Lepidoptera, the discal cell is a large wing cell near the base, just anterior to the wings midline. 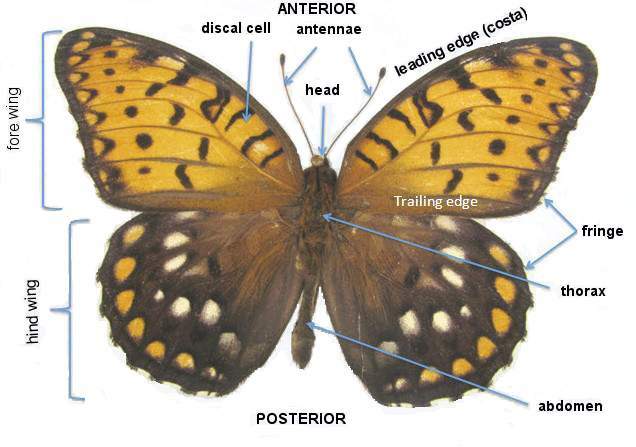 Discal spot - In Lepidoptera, the discal spot is a marking in the wing pattern found at the distal end of the discal cell. Distal - removed from the point of attachment. It is used in contrast to the term proximal. Dorsal - near the backbone in vertebrates or the analogous area in invertebrates. In Lepidoptera and Odonata, it may be loosely described as the top of the animal as it is observed resting on a flat surface. It is used in contrast to the term ventral. Fore wing - In Lepidoptera and Odonata, the fore wings are the anterior pair (closer to the head). Head - In insects, the head is the anterior section of the body (comprised of head, thorax, and abdomen) and includes the mouth, eyes, and antennae (if present). Hind wing - In Lepidoptera and Odonata, the hind wings are the posterior pair (furthest from the head). Larva (larvae) - In insects which undergo complete metamorphosis, like Lepidoptera whose larvae are also called caterpillars, the larval stage follows hatching from an egg and precedes pupation. Compare to nymph. During the larval stage, the organism feeds and undergoes a series of molts until it is ready to pupate in order to metamorphosis in to the adult stage. Multivoltine - Organisms that have many broods per year. Nymph - In insects which undergo incomplete metamorphosis, like Odonata whose nymphs are also called naiads, the nymph stage follows hatching from an egg and precedes the adult stage. During the nymph stage, the organism feeds and undergoes a series of molts until it is ready to metamorphosis in to the adult stage. Occipital crests - area in between the eyes on the dorsal part of the head. Orbicular spot - a round or elliptical spot located in the median area of the front wing near the costa. Pectinate - a descriptive term referring to feather-like antennae. PM line - postmedial line, a line that is formed at the outer edge of median section of the wing	separating the terminal section from the rest of the wing. Posterior - located behind or towards the rear, closer to the tail-end. It is used in contrast to the term anterior. Proximal - close to the point of attachment. It is used in contrast to the term distal. Pupa (pupae) - In insects which undergo complete metamorphosis, like Lepidoptera, the pupal stage follows the larval stage and precedes the adult stage. The insect does not feed during this time, and is often encased in a cocoon. Reniform spot - a kidney-shaped (usually) spot in the outer portion of the front wing, near the costa. Stigma - In Odonata, the stigma is a wing cell filled with blood and is found along the anterior edge of the each wing towards the apex. It may be brightly colored and it is used to signal mates or rivals. Sub-genital plate - plate below S8 that holds eggs when enlarged, often has characters used in identification. S1...S10 - abdominal segments increasing in number towards the posterior end. Thorax - In insects, the thorax is the middle section of the body (comprised of head, thorax, and abdomen). In adult Lepidoptera and Odonata, the wings and legs are attached to the thorax. Univoltine - Organisms that have one brood per year. Veins (wing) - In Lepidoptera and Odonata, the membranes of the wings are supported by a network of veins, which are tubes carrying air. The arrangement and sometimes coloration of the veins may be helpful in distinguishing a family or a species. The areas formed between the veins are sometimes referred to as cells and are used for diagnostic reference. For example, see discal spot or stigma. 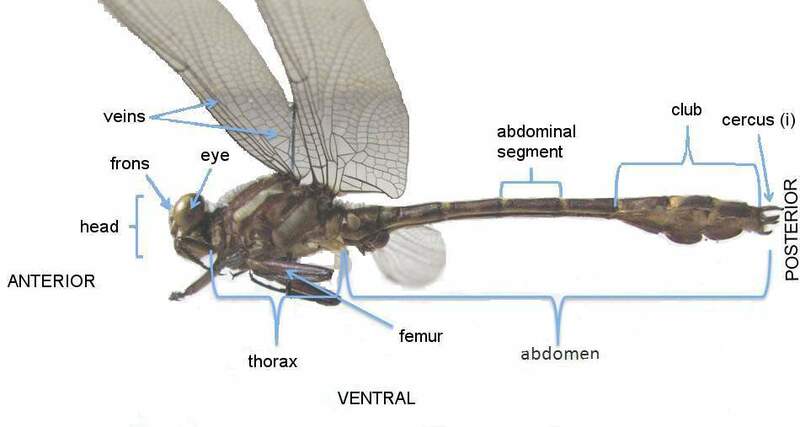 Ventral - the side toward the belly surface in vertebrates or the analogous area in invertebrates. In Lepidoptera and Odonata, it may be loosely described as the bottom of the animal as it is observed resting on a flat surface. It is used in contrast to the term dorsal. Wrist - In Lepidoptera and Odonata, the wrist refers to an imaginary line across the wing as if the wing were analogous to an arm.